This is a recipe for a great pasta dish that can be prepred in less than 15 minutes. All it involves is making some pasta and mixing it with some pesto. Pesto is a traditional Italian sauce made of puréed basil, garlic, pine nuts, Parmesan cheese, and olive oil. This is how I made my dish. Bring a large pot of salted water to a boil, add the pasta, and cook according to the package instructions or until al dente. (8-12 minutes in this case) Drain well & return to the pot. While the pasta’s cooking, grind together the ingredients for the pesto to form a paste. I used my food processor. You could use a mortar and pestle instead. Mix together the pasta and the pesto. Add some of the pasta water to this. This adds some body to the pesto and also helps to create a sauce that binds the pesto to the pasta. Pesto can be used in so many different ways and can dress up a recipe in no time. I like to use it as a spread on toasted bread and in sandwiches with a bit of mayonnaise. Sometimes, I add a little vinegar to it and use it in my salads. It makes a great dressing. It also goes well with mashed or baked potatoes. Try it out …I’m sure you will not be disappointed. This is my contribution to Presto Pasta Nights, a weekly event hosted by Ruth. i like that you combined traditional basil pesto and added elements of sun-dried tom to it...looks great as usual! Love Pasta in any form and the pic is making me drooll!!! pasta is lovable in all forms,but basil and sun-dried tomatoes are hard to come by here in Delhi,maybe if I can get some, would like to try this as a spread too and in b/w your baklava is still spinning drooly circles in my head! I love your pesto dish with sundried tomato. Great idea of adding Sun-dried tomatoes to the usual basil pesto.. I will definitely try that next time since i love them. A great extra ingredient to what is already my favorite dish - pesto! Thanks for sharing with Presto Pasta Nights. I'm up for Pasta anytime!! Looks yummy..and Basil pesto..delicious! I got a new basil plant from trader joes yesterday. Going to try this recipe with penne pasta. Lovely presentation. Can I use any other nuts for this other than walnuts. I do not have any right now. Those pipette pasta looks adorable! 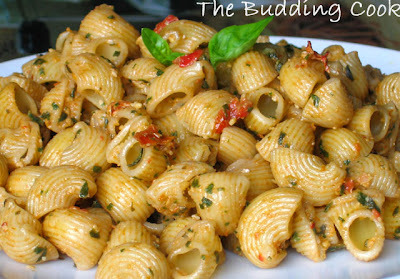 pasta , pesto, sun dried tomatoes, basil....definietly a must EAT...yummy ! Wow! Love sun-dried tomatoes, even make my own, and this pesto looks terrific!!! never seen such a glamorous pasta! looks wonderful! Hey TBC we just made the same thing. Will try adding some nuts to the pesto next time. Pasta looks delish !! Excellent, TBC...want to taste some..
Kribha- do let me know. Tee-please let me know how u like it. Pooja- yeah:)I love it with toast. I think I saw that post where you make your own. I will check again. Actually, I have started experimenting with other cuisines only recently. I am liking Italian a lot & cooking with fresh herbs does make a lot of difference, right? "eat through" our eyes first, don't we? Cynthia, damn the screen! I feel the same way when you dish out those fab recipes. Sometimes it's just pure torture going thro' your posts. Your pics are so appealing & your food comes to life! Nice picture and I like the recipe. Thanks for sharing!